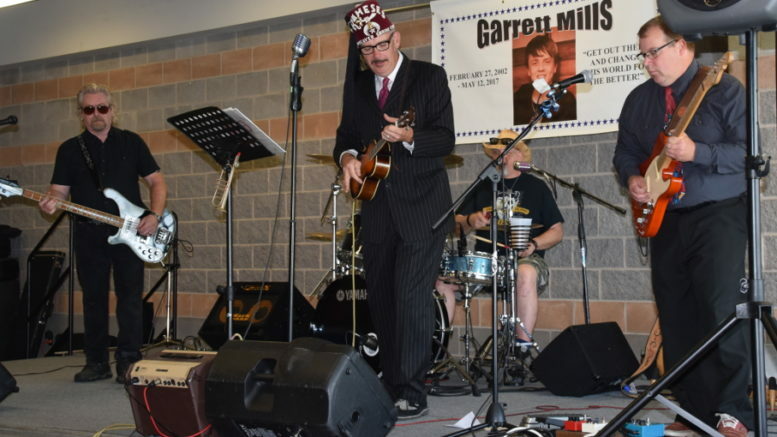 Music and comedy, two things Garrett Mills loved, will fittingly highlight the second annual Garrettfest this Saturday at the Strathcona Paper Centre. The fundraising concert/comedy night will once again raise money for the Garrett Mills Memorial Scholarship Fund, which is presented to deserving graduating Napanee District Secondary School Students. This year’s musical lineup includes Kings Of The Cold, which is fronted by Solomon Woodland, The Great Unwashed and The Trevor Walsh Group. New this year will be a comedy element, with Ryan Dennee taking the stage. “Ryan has been a good friend of mine for a few years now and he just wanted to help out anyway he could so I said how about you do a set for us?” said Collins. No stranger to comedy himself, there’s been talk of Collins getting on stage as well. The event will be hosted by Bill Welychka. For Collins, launching an event in memory of his son name and establishing the scholarship in his name was his way of helping his son fulfill his ambitions after his life was cut tragically short by an accident while playing in a local park. Collins and his family had a chance to see that legacy fulfilled last June when NDSS students Emma Cronkwright and Brock Vale were the first recipients of the fund, which goes to students who display exceptional kindness, generosity, selflessness and a positive attitude-traits all shown by Mills. Seeing the receiving students express their gratitude and appreciation for Mills was exactly what Collins was hoping to see when he established the fund. Just weeks before the accident Mills had told his father his intentions to leave behind a positive legacy. Collins and his wife have since taken upon themselves to help continue his mission through the scholarship and music festival. Tickets for the event are $20 and available in Napanee Chuck’s Roadhouse, Deadleaf Distinguished Gentlemen, Gray’s IDA, Marie’s Place and Pita Pit. Students from NDSS who show their student card can get half-price admission. Doors open at 6 p.m. with the entertainment beginning at 7 p.m.
Tickets will also qualify guests for several door prizes as well as access to a live and silent auction which includes items such as a Yamaha electric guitar signed by the Glorious Sons, a wine bottle autographed by Rob Baker, Paul Langlois and Gord Sinclair of the Tragically Hip, a 42 inch RCA LED television, a golf package for four at Loyalist Golf and Country Club and framed autographed jerseys from Bobby Orr, Paul Henderson, Don Cherry and Marcus Stroman, among several other items.